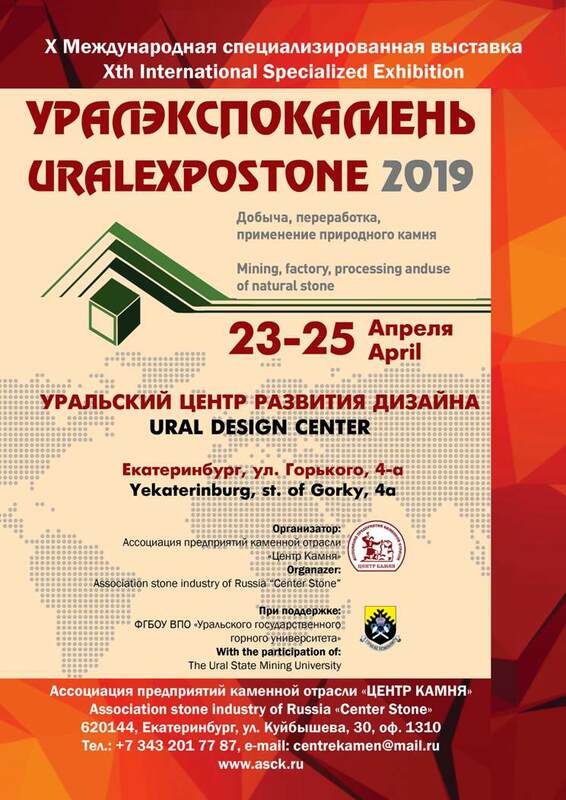 Tenth anniversary international specialized exhibition "URALEXPOKAMEN 2019" with its undisputed, in recent years, the Director and organizer Olga Glinsky is planned as a big event event for professionals of the stone industry of Russia and other countries of the world with a rich business program with conferences, round tables and, according to tradition, the evening holiday feast. In 2018 and in a few days of this year, we have received consent to participate in such a significant event for all colleagues from the permanent participants of the exhibition, Members of the Association "center of Stone", from foreign participants, and from new, unfamiliar to us, companies from Russia. Applications for Contracts from participants from abroad came: Pedrini, Prussiani, Bruno Export(Italy), Gestra (Czech Republic), Quanzhou Wanlong Stone, Quanzhou Zhongzhi Diamond Tool Co, Jiangxi Xinguang Diamond Tools Co, Xiamen Chii Machine Co, Xiamen Betopper Special Equipment Manufacture Co(China), etc. Many of the members of the Association" center of Stone " confirmed their decision to participate in the exhibition and events of the business program: GC "Granite – invest", JSC "Koelgamramor", LLC "grinding Tool", LLC "Almir", LLC "Stone Age", UK "Mining Department OF "Revival" and others. Life has made its own adjustments. Tenth anniversary international specialized exhibition "URALEXPOKAMEN 2019" this year we will hold in the historic centre of the city, at the site of the URAL CENTER of DEVELOPMENT of DESIGN AND ARCHITECTURE, but without Olga Glinsky, who tragically died at the end of last year. The site for the exhibition, which, as planned, will be held from 23 to 25 April 2019-approved. Address of the exhibition center: Ekaterinburg, Gorkogo str., 4-a. The lease agreement for the exhibition center has been signed. Construction of the exhibition and design (construction of stands and provision of necessary additional equipment) will be provided by the company "INTER". We remind you that until the end of the exhibition there are unique conditions for participation in all activities of the business and holiday programs, as well as in advertising campaigns on the conditions of the approved REGULATIONS ABOUT the SPONSORS of the 10th ANNIVERSARY INTERNATIONAL SPECIALIZED EXHIBITION URALEXPOKAMEN 2019 (in the Appendix). Sponsors have extensive advertising and PR opportunities. This will allow your companies to Express themselves, both during the exhibition and long before it. The implementation of sponsorship programs is designed to enhance the marketing effect of participation. It will also provide additional opportunities for the promotion of sponsoring companies in the markets of Russia and other countries of the world and, of course, will ensure the success of all events and will bring the authority of the exhibition to a higher level in Russia and the world. Please show maximum activity on the participation in the exhibition "URALEXPOKAMEN 2019" and send a return email Your proposals on the formation of the Business program of the exhibition (relevant topics, issues and proposals, and the intention of Your company to participate in the events). For the production of the next issue of the magazine "Stone around us" we ask all the necessary materials for publications (text information and photographs) to agree before February 10, 2019. © 2013 - 2019 Association of stone industry "Center Stone"